The only foreign buyer of the Panther was the Argentine Naval Aviation, who bought 24 ex-USN aircraft in 1958. The catapults on the then only Argentine carrier, ARA Independencia (V-1), were considered not powerful enough to launch the F9F, so the aircraft were land-based. The Argentine Panthers were involved in the general mobilization during the 1965 border clash between Argentina and Chile but no combat occurred. They were taken out of service in 1969 due to the lack of spare parts and replaced with A-4Q Skyhawks. 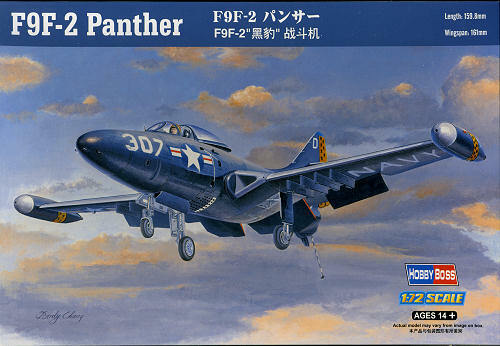 There has been some chatter concerning this new Hobby Boss Panther in terms of how it relates to the 1/48 scale kit. From what I can see, the rivet count is less, and it appears that the incorrect canopy angle has been taken care of, but really, that won't be known for sure until the kit is built. The kit is molded on three standard grey plastic and one clear plastic sprue. There are small windows on the clear sprue for the photo recon Panther so you can be sure it will be released soon. As mentioned, the rivet monster did not go nuts on this one. Rivet detail is there but is more subdued and there is less of it than on the larger scale kit. The kit's cockpit is a big improvement over the Hasegawa kit in that the instrument details are raised and there is a more detailed seat. A decal is provided for the instrument panel if one wishes to use it. This increased detail level also goes to the wheel wells and the struts look like they have greater detail as well. The Panther is a pretty simple aircraft as these things go so build time should be minimal. One entire sprue is dedicated to weapons. The kit will require holes in the wings to be opened if you want to use them. There are six single stub 5 inch rocket pylons and one inner one for a 500 lb bomb. Now if you want all eight wing stations to have bombs, you can do so as there are additional bombs and racks to take care of that. I imagine the range would then be about 50 miles with that load! Wing tip tanks are separate items and there are no other wing tip options. Panthers rarely flew without these tanks. The one think the Hasegawa kit has on this one is a separate speed brake. This one is molded closed. The kit provides markings for two aircraft. 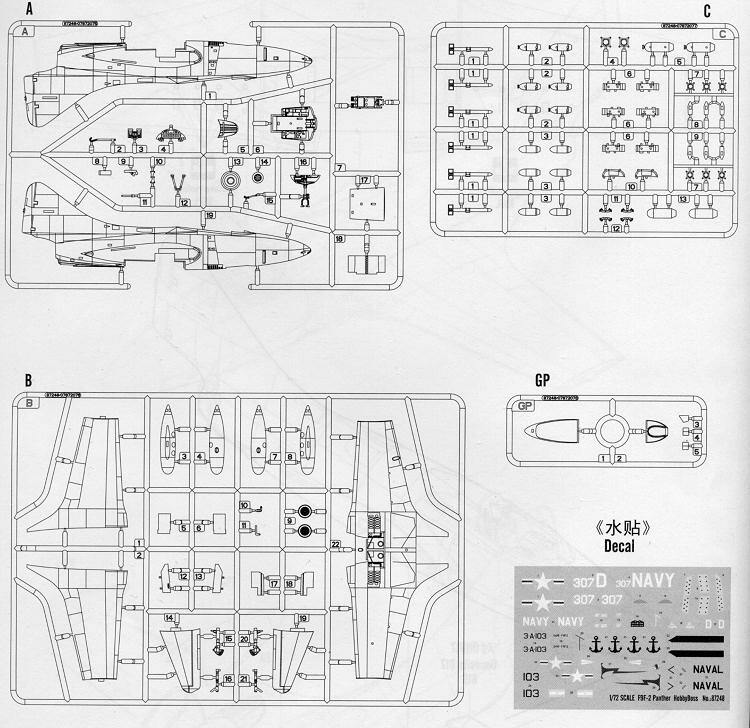 The box art plane is one that is duplicated on the Hasegawa kit and is for an overall sea blue aircraft from VF-123. The box art shows the color bits to be an orangeish yellow, while the decal sheet shows them as a bright yellow. The other option is for the Argentine plane in light gull grey over white. As a note, the instructions would have you paint the wheel wells on both items in white. This would not be accurate for the USN version as you can see from this photo, the wells are a lighter shade, probably chromate green. Wheels could be silver or sea blue. I should also point out that the interior was interior green with black console sides and tops on the USN plane and dark gull grey on the Argentine version. 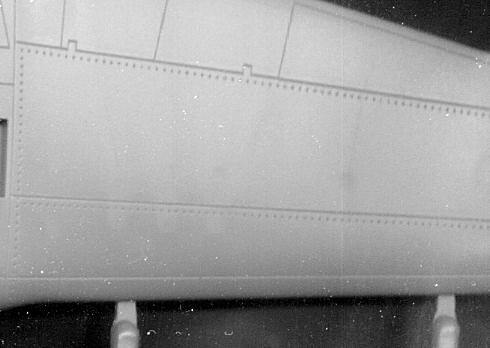 An instruction from March 1954 dictated that all interiors will be repainted in the grey when the planes go through overhaul. Decals are nicely done and very thin so care is needed when using them. 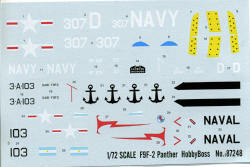 Those who have old Super Scale decal sheets will probably have some other options available. It is so very nice to see a new Panther in 1/72. This one looks to be a real beauty and benefits from how far along the hobby has come over the years. Don't toss your Hasegawa kit as it is still nice too, but this one is a bit nicer. Thanks to Squadron Products for the preview kit. Get yours today at your favorite retailer.